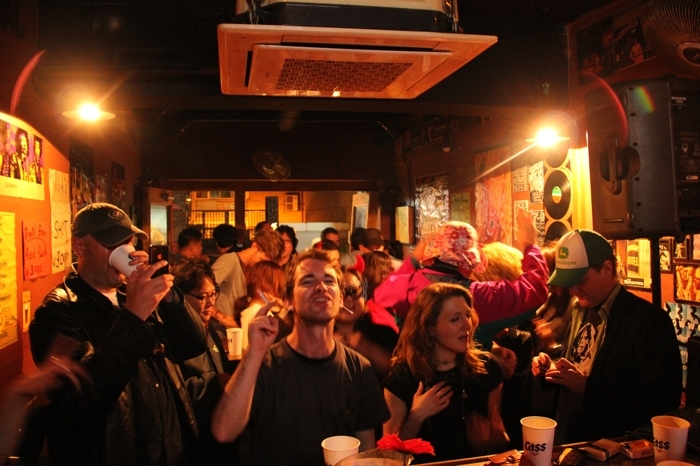 Quick shout-out to a well-known bar owner in the increasingly well-known foreign enclave of Haebangchon, who facilitated yet another great night out at the recent HBC Fest. Coinciding with Halloween, the twice-yearly weekend music festival was again a great success, despite the inclement weather (which forced hundreds of street-drinkers into the venues to actually witness some of the performers perform). Though a quieter festival than anticipated, many brave souls without personal space issues packed the participating live music venues to many times capacity. Those such as myself, who do get a bit claustrophobic in crowded spaces, didn’t at all mind partying outside in the easing rain, not least because extremely sluttily dressed women (which is of course considered not only acceptable, but rather appropriate on Halloween) look even sluttier when wet. Anyhoo, I give the quote of the evening (many times over) to one of Haebangchon’s best loved alcohol dealers who, apparently at the last minute, decided to spend her Halloween as Pippi Longstocking. This almost instantaneous transformation involved the application of some dots to the face, and pigtails. She did suddenly look like a Korean Pippi Longstocking. Now, Ms. Y.G.Y. has an excellent grasp of the English language, though naturally she retains the habits of her mother tongue, one of which is that the Koreans tend not to differentiate between the short ‘I’ (as in bit) and the long ‘E’ (as in beet). This resulted of course in our extroverted friend (who is a rather attractive woman on her worst day) enjoying the increasing attention and laughter she was generating, thereby continuing to play up to the crowd. This went on for a while… In other news perhaps of interest to at least half of Korea’s foreign community, President Lee Myung Bak will soon end his compulsorily single five-year term, which means (as one very serious and staid female university student explained to me this morning) that all South Koreans will soon be having a big erection.